This article was provided by Dr. Gwen Hackler, the Director of the Academic Grants Office. 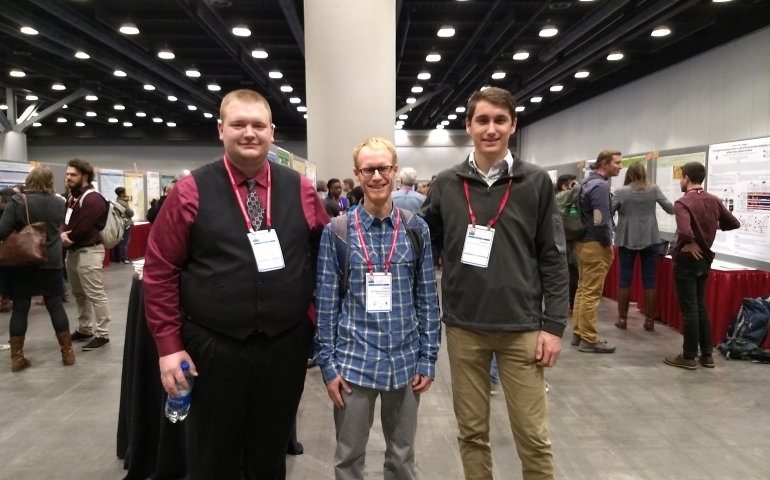 Southern Nazarene University is pleased to announce that two SNU students were awarded the President’s Prize award for second place in the student poster competition at the national meeting of the Entomological Society of America in Vancouver, BC from November 11-14. Jackson Winslow and Phillip Davis, along with faculty mentor Dr. David Hoekman, created the poster, entitled Effect of introduced trout on stream macroinvertebrate communities in a tropical montane river system, based on the outcomes of their SNU Summer Research Experience project at QERC in summer 2018. Their research focused on the role of introduced trout in the Savegre River and its tributaries near QERC and is the culmination of several student projects. This past summer they built and deployed fish-exclusion cages and measured the response of the stream-dwelling invertebrates. “Our project also paved the path for future follow-up projects that can help both QERC participants and locals discover more about the unique habitat of San Gerardo de Dota in Costa Rica. The research was a life-changing experience for me,” explained Jackson Winslow. Jackson and Phillip’s research was sponsored by the Oklahoma Space Grant Consortium (OSGC) and the SNU Catalysts. The SRE helps promote STEM careers by training students in how to conduct scientific research which can lead to applications for graduate school. The OSGC is a partnership of Oklahoma universities, corporate, and government entities that provide STEM and other aeronautics and space-related student opportunities to participate in NASA’s mission directorates. SNU is the only private university participating in the OSGC. SNU has been a member of the OSGC since 2002 and hasgranted more than 120 financial awards to students totaling more than $150,000.